Embattled automaker reports larger than expected in fourth quarter loss and burns through more than $6 billion in cash; says it needs new loans this year. What should the government do about GM and Chrysler? NEW YORK (CNNMoney.com) -- General Motors posted a $9.6 billion net loss in the fourth quarter, a period in which its sales plunged and it needed a federal bailout to avoid filing for bankruptcy. The company also disclosed that it burned through $6.2 billion in cash during the last three months of the year. The company ended the quarter with cash of $14 billion. If not for the $4 billion federal loan it received on Dec. 31, GM's cash level would have fallen below the $11 billion to $14 billion in cash the company has said it needs to continue operations. Since receiving the first installment of that loan, GM (GM, Fortune 500) has gotten another $9.4 billion in federal assistance. The company asked for an additional $16.6 billion in the turnaround plan it submitted to the Treasury Department last week. GM disclosed Thursday it will need this at least $9 billion of that money in 2009 to weather the current downturn. The company is expecting to burn through another $14 billion in cash this year, with most of it taking place in the first quarter as the company struggles to deal with weak demand and significant overhead costs. GM Chief Financial Officer Ray Young said the company's request for more loans was made with that weak outlook in mind. "We're not forecasting any heroic recovery for the industry in '09," he told investors. The results came the same day that chairman and CEO Rick Wagoner and other top GM executives were in Washington to meet with the federal government's auto task force to discuss the turnaround plan it submitted last week. Analysts say the future of the company now depends almost solely on whether it receives more loans. Efraim Levy, an auto equity analyst with Standard & Poor's, said he thinks GM could very well burn through more than $14 billion this year. "Do they get money or not get money, and do we prolong this or not prolong this?" added Kevin Tynan, an auto analyst with Argus Research. "I think all the other questions are answered. Right now the companies and analysts are looking at 2009 as being a lost cause. This first quarter's results are going to be even more brutal." GM also said it anticipates its outside auditors will issue a statement on whether the company is a "going concern." The statement could be important not only to investors but to the federal officials who are determining whether the company is viable for the long-term. If the government determines GM is not viable, it would demand immediate repayment of the company's loans. The auditor's statement will be included in GM's year-end results filing with the Securities and Exchange Commission. GM disclosed Thursday it had filed for a two-week extension to submit that report. The company also disclosed that its hourly and salaried pension plans are currently underfunded, on a combined basis, by about $12.4 billion. Despite that, GM said it does not anticipate needing to make a further contribution to those funds over the next three years. As bad as GM's results were, it could have been worse. The company posted a $533 million gain because of the fact that GMAC, the finance unit in which it held a 49% stake during the quarter, got its bond holders to agree to swap debt for equity. GMAC become a bank holding company as a result of the debt swap, which significantly reduced GM's stake in the unit. Excluding special items, GM lost $5.9 billion, or $9.65 a share, in the quarter. Analysts surveyed by Thomson Reuters had forecast a loss of $7.39 a share, compared to a profit of 8 cents a share on that basis a year ago. The operating losses were particularly pronounced in GM's core North American market. It lost $3.5 billion before taxes in the quarter, up from a $1.3 billion loss in North America a year earlier. Revenue in the North American unit plunged about 32% to $19.3 billion. GM's market share also slid 1.7 percentage points to 21%. But GM, which now sells more than half its vehicles outside of North America, is facing challenges around the globe. Losses more than quadrupled in Europe, and the company lost money in its Asia-Pacific and Latin America-Africa-Middle East units. GM posted profits in those two regions a year ago. Overall revenue at GM plunged 34% to $30.8 billion, significantly worse than the Thomson Reuters forecast of $35.1 billion. 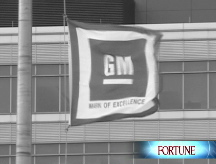 For the full year, GM reported a net loss of $30.9 billion. The automaker has posted net losses of $82 billion over the past four years as its U.S. sales and market share plunged and it closed plants and slashed staff in an unsuccessful effort to stem losses. Shares of GM were little changed in late morning trading Thursday, but were down as much as 14% shortly after the market opened. Separately, GM rival Ford Motor (F, Fortune 500) filed its own year-end financial statement with the SEC Thursday. Its filing included an "unqualified" statement from the company's outside auditor that "there is no substantial doubt" about Ford's ability to continue as a going concern. Because it arranged for billions of dollars of asset-backed loans and lines of bank credit years ago before the current credit crunch, Ford is in a much better cash position than GM and privately held Chrysler LLC. Ford has yet to need federal loans but it has asked the government for a $9 billion line of credit in case the economy deteriorates further.